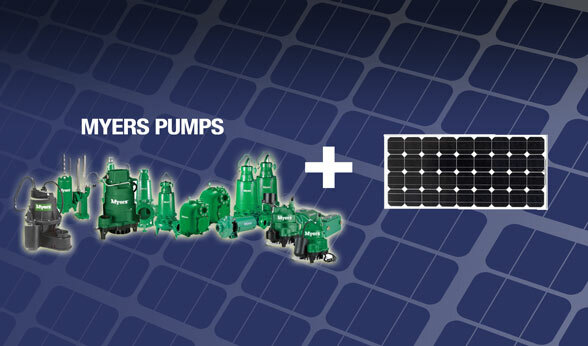 ...Myers Pumps & Agriculture Solar Powered Water Pump Power Increases Efficiency, Lowers Costs and Maintenance. We offer tailor-made solutions that work with you to create energy cost savings. Myers Pumps and Agriculture Solar are the right choice to handle stringy trash, fibrous wastes, slurries and other difficult to pump solids without plugging the impeller. The Myers Pumps have been field proven to provide reliable operation and dependable performance. Myers offers a complete line of agriculture pumps, controls and accessories to meet your needs. The Myers Pumps and Agriculture Solar energy systems are designed for demanding jobs where a lot of water is required over a long period of time. For irrigation it's built for one purpose only - continuous high performance service. Ruggedly built to meet the demands for long, hard continuous service without over-working or overloading the motor; Manufactured to precise performance specifications; Corrosion resistant impellers for long life; Simple design for powerful, efficient operation and easy servicing; Proper impeller alignment for smooth, quiet running; Unique diffuser design provides quick automatic prime. No additional water needed for repriming after installation; Common brackets, cases and gaskets on all sizes simplified parts selection. We have considered the complete package. At Agriculture Solar, Myers Pumps and Agriculture Energies can be your simple water pump solution. Myers was founded in 1870 by Francis and Philip Myers in Ashland, Ohio. The brothers began by building farm implements and then engineered and manufactured the first double-acting hand pump that delivered water on both the up and down strokes. From this modest beginning, the Myers pump line grew and evolved over the decades. Agriculture Energies systems have been dedicated to modern agricultural irrigation and successfully active in the top irrigation fields for over 10 years and continues to bring the tried and true principles and advantages of solar hybrid power. Think about it, and then make your move. Let Myers Pumps and Agriculture Solar water management provide you with decades of reliability and lasting value. We invite you to explore the possibilities of our reliable hybrid solar powered pump solutions.